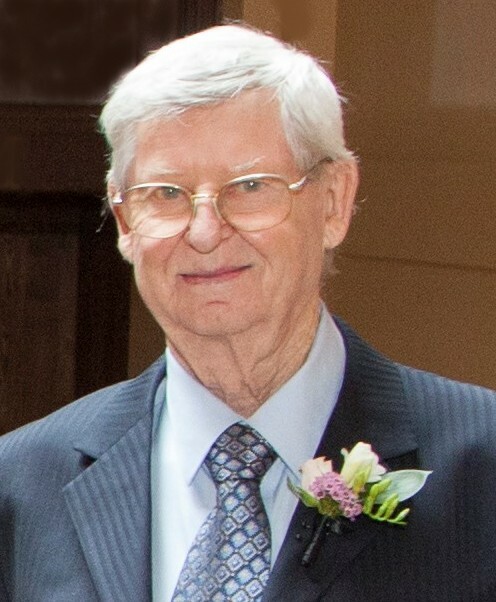 Donald Stuart Haslehurst passed away peacefully at Mississauga Trillium Hospital on Tuesday, November 20th, 2018. Age 85 years. Beloved husband of Colleen (Larmondin) Haslehurst for 63 years. Loving father of Tom (Maria), Katheryn (Brian Shipley), John, Trudy (Rob Bell), Carrie, Ronald (Rose), Bill (Shirley), Ryan (Lisa), and the late Shelley. Dear grandfather of Brian (Rhonda), Andrew (Holly), Shelley (Seamus), Alexandria (Marshall), Alicia (Richard), Brad, David, Thomas, Kayden, and Owen. Great grandfather to Maddison, McKenna, Hunter, Austin, William, and Allison. Dear brother of Mary (late Jim), Joan (Bruce), Jackie (John), and the late Royce (Alberta, of McDougall), and the late Ted (Mary, of B.C.). Fondly remembered by his nieces, nephews, other relatives and friends. Friends will be received at the Logan Funeral Home, 81 James Street, Parry Sound (705-746-5855), on Friday, November 23rd, 2018 between the hours of 2:00 – 4:00 & 7:00 – 9:00 P.M.
Funeral Service in the Logan Memorial Chapel on Saturday, November 24th at 1:00 P.M. Luncheon to follow. Interment Sylvan Acres Cemetery in the spring. As expressions of sympathy, donations to the Canadian Cancer Society, or the charity of your choice would be appreciated. Send a condolence to the family of DON HASLEHURST.